'Gentle Reminder' (Keith Keppel, R. 2013). Seedling# 07-79C. TB, 42" (107 cm), Midseason bloom. Standards pale yellow (M&P 9-E-1); style arms warm white (9-AB-1), cream and pale lavender; falls light lavender-blue, light yellow (9-J-1) deep in throat; beards light yellow, lavender-white end. 'Silk Road' X 'Venita Faye'. Keppel 2014. 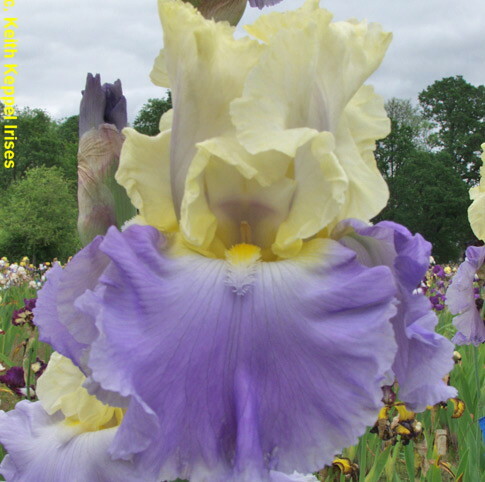 From Keith Keppel Iris catalog, 2014: GENTLE REMINDER M 42" (Silk Road X Venita Faye) No nagging, just gentle ruffling, with soft colors including lemon cream standards, uniform soft lavender falls with tip of beards matching, the inner beard pale yellow.S uperb uniformly good grower, with show stalks and plentiful buds . See it and you won't need to be reminded again! #07-79C. $50.00.